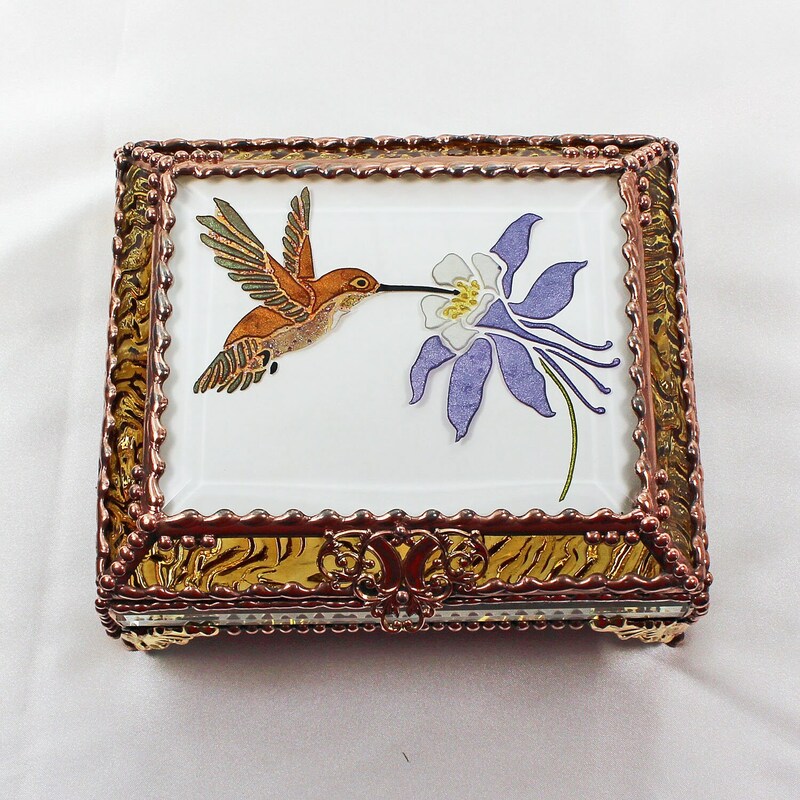 Translucent and shimmery hand painting sets off this Hummingbird design. Stained glass reflects off the mirror and is accented with hand worked metal. Each bead and texture is created one at a time. The unique shape of the lid is our own design. It is raised with angled sides. This not only enhances light reflection, it also makes it much more durable by dispersing pressure and strengthening the hinge. 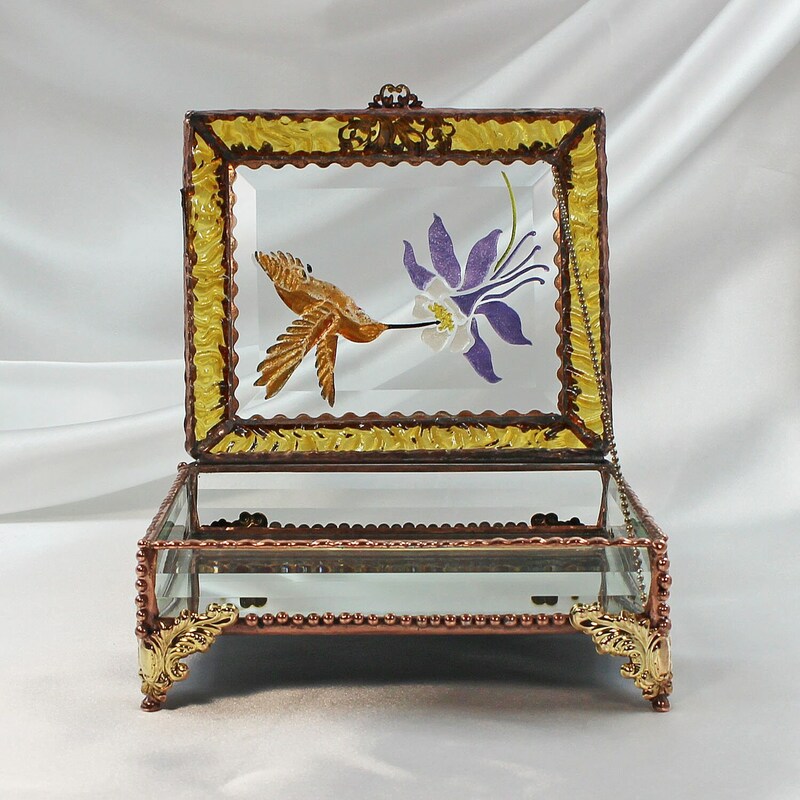 The colored lid is attached to a base made of hand cut beveled sides and a mirrored bottom. This clear base allows light to enter from any direction. The mirror bottom illuminates the beauty of all objects placed within it and will also illuminate the colored lid. The box looks like it has been lighted from within and direct sunlight creates a beautiful prism rainbow effect. A completely unique treasure box designed to last a lifetime. Size 5" x 6" x 3"
We will ship your item within one to two business days after receiving payment. All of our glass items are packed with extreme care. We use recycled materials when available; all items are wrapped in bubble wrap to ensure safe and secure shipping. If you are buying multiple items I will pack them safely together. We will ship either Priority Mail or First Class Mail and will notify you when your order has shipped. Please open your box within 24 hrs after you receive it. If there should be an issue with an item you have ordered (e.g. cracked glass), I must hear from you within that 24 hour period of receiving your item. If I do not hear from you within this time frame, I can only assume that the piece arrived safely with no damage. 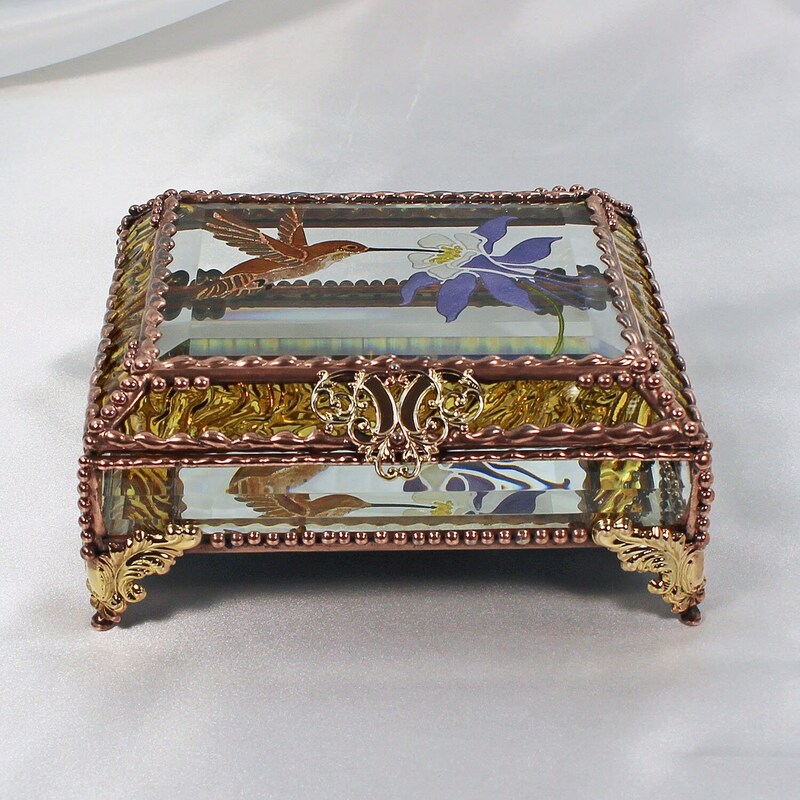 Glass Treasure Box will not be responsible for cracked or broken items if I hear you from you beyond this time frame. If you are not satisfied with your item, you may return your item but you must notify me within 48 hours of receipt to receive a return merchandise approval. Your item must be packed safely to ensure no damage occurs while in return transit. Return shipping is at the buyer's expense. Once the item is received, it will inspected it for any damage. If no damage has occurred, a refund of the purchase price less 7% and shipping will be given within two days of receipt. If damage has occurred due to insufficient packing materials, a refund less 27% and shipping will be given. International Shipping: I do ship internationally typically via First Class International. This shipping is the most economical but it is not trackable nor traceable. Shipping has typically been 6 to 10 days but can be longer. There is a risk of items not being delivered using First Class International. If you would prefer to ship via Priority International, which can be tracked and traced, please let me know in the notes of the check out. This type of shipping is more expensive. I will send you a notice how much the additional shipping will be. Please let us know of any problems you have with your order. Further information is listed in our shipping policies.